Hello! I hope you are having a wonderful weekend! After making my Halloween card, I still had my Bo Bunny Boo Crew supplies on my table, so I decided to scrapbook a layout of Sabrina's Halloweens, 6 in all so far. I love layouts that show photos over a period of time and show how much a person has changed/grown. 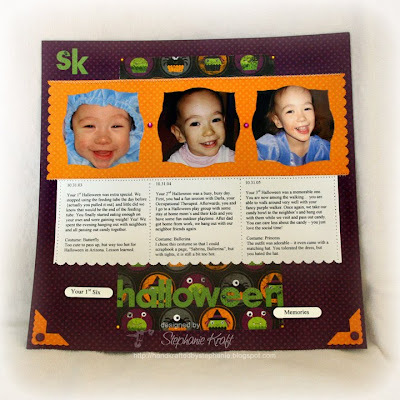 I have completed scrapbook layouts of her first 3 Halloweens, but the photos from the last 3 remain in the "to scrapbook" pile. As any scrapbooker will honestly tell you, I'm in no way "caught up", but I don't worry about that. 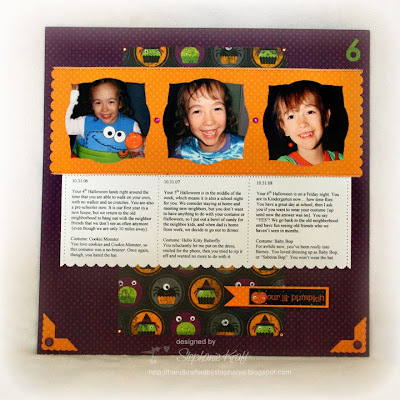 After all, for me, scrapbooking is a life-long hobby which allows me to preserve our family memories. Plus, as an avid photographer and a scrapbooker, being caught up is a very unrealistic scenario. When I first saw Mercy's sketch, MTSC37, the first thing I thought of was a scrapbook page with 3 photos. My first project with her sketch was a card, but in the back of my mind I knew that I wanted to come back to do a layout. Accessories: Labels Three (Spellbinders), Scalloped Scallop border punch and Scalloped Photo Corner punch (EK Success), Word Window punch (SU! ), Scallop Corner Rounder punch (Marvy), Rhinestones, Boo Crew Combo Stickers (Bo Bunny), Brads (CTMH), Paper piercer, Font: Times New Roman, Foam tape, Thread, Sewing machine. That paper is just darling! 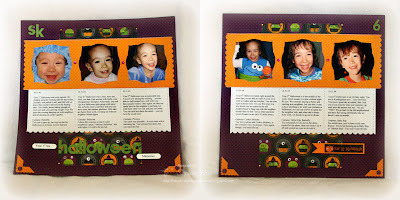 What a cute layout and love how you used the labels for the photos.